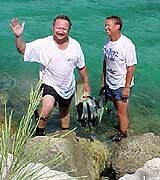 The weather in March seemed to be ideal for a trip to Grand Bahama from Port Canaveral . But ideal as it was, the wind was coming right on our bow [from the south] so we needed to motorsail most of the way from Port Canaveral south to Lake Worth and then sail at an angle across to West End, the closest customs location on Grand Bahama Island. 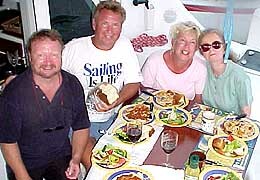 My guests were Captain Vic and Joan, and Captain Fred and Colleen. On the way south we tried to stay as far out of the Gulf Stream as we could with the water temperature ranging from the low 70s to the low 80s in the strongest current. All in all it took 33 hours to get to West End. We arrived just in time to clear customs, grab a slip, and settle in. As we were in a record heat wave the air conditioner was a great help. West End was a surprisingly great place to stop for a couple of nights as the slips offered access to crystal clear waters, a long quiet sandy beach and a breakwater, a great fresh water pool, a high end restaurant, and a tiki bar with a great band although it quit early. In short a great place to wind down from the trip. Then we were off to Lucaya with its close access to the Freeport casinos, international marketplace and a variety of activities. Of course we had overlooked the fact that it was bill fish tournament week as well as the opening week of Spring Break month. Lucaya was really a different destination from West End ... but entertaining enough. Fortunately the trip from West End [about 30 miles] was fast and we had left West End early so we caught the last open dock about 1 p.m.
After a couple of nights in Lucaya we set off for Port Canaveral with the wind northeast for a beam reach most of the way back. The return trip from Lucaya took 23 hours with a max wind of about 20 kts. Our fastest over ground speed was 12.5 kts.